Welcome, FoxChase Wires is a small country kennel located 50 miles west of Chicago. Health, temperament, and conformation are essential in our line and we strive to breed a sound dog for show and family lifestyle. Our puppies are home raised, as members of the family for the best possible socialization. Since our first litter in 2002 we have bred 14 champions. We invite you to browse our webpage and e-mail us with comments or questions. Foxchase is a member of AKC Breeder of Merit Program. CH. Commander's Bearded Pirate "Thatcher"
CH. Cheviot's Ferrari of FoxChase "Tess"
Pictured above are our first two wires, Thatcher and Tess. 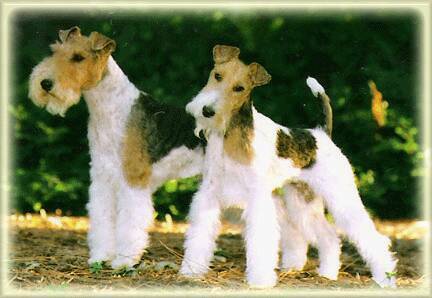 Thatcher, our first Wire Fox Terrier was purchased from Cheviot Wires and became our first Champion that we finished. Tess joined Thatcher in 2000 and earned her Championship in 2001. About Thatcher. When my son at age 12 wanted to get a dog, he was given a AKC Breed book, and told to do his research and come back and tell us what he liked. He came back and showed us his pick, the Wire Haired Fox Terrier. My son and Thatcher have enjoyed working together as a team in Junior Showmanship and obedience.